Hikers head out on the Whitefish Trail June 26 at the Lion Mountain trailhead. There’s not much vertical relief along the lowlands at the head of Whitefish Lake. Gentle pastures and wetlands stretch from the BNSF Railway tracks to the broad flood plains at Swift Creek. It’s an easy walk or ride along Delray Road to traverse from one side to the other. From a trail-builder’s perspective, however, this total lack of topography might prove to be the most challenging yet in mapping the future path of the Whitefish Trail as it now progresses to the east side of the lake. A pedestrian bridge is needed for the railroad crossing, the wetlands are environmentally sensitive and could require a 1,000-foot boardwalk, while the Swift Creek crossing needs a long span stable enough to support a mountain bike. 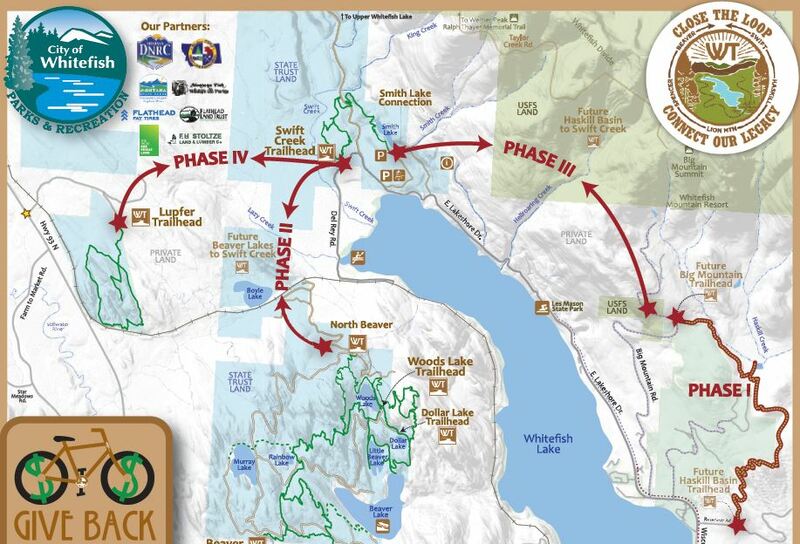 Connecting the Beaver Lakes section to the Swift Creek trailhead is just one crux remaining in Whitefish Legacy Partners’ efforts to “close the loop” of the Whitefish Trail. The nonprofit behind the trail-building effort is aiming to complete a 55-mile recreational loop circling Whitefish Lake by 2020. Gunderson has flagged potential trail routes through the Swift Creek area — nothing has been decided yet — but he’s optimistic it can be done. He describes the landscape as rivaling areas of Glacier National Park. The Whitefish Trail effort, decades in the making, began in earnest in 2010 when the first few miles of trail were opened around Lion Mountain. About 36 miles of trail and 10 trailheads have been built since then. Beyond Swift Creek, preliminary plans show the trail climbing up the lower flanks of Big Mountain into Hellroaring Basin where it then traverses below Elk Highlands to Haskill Basin and eventually into town. “It’s certainly an exciting time to be thinking about closing the loop,” said Legacy Partners executive director Heidi Van Everen. To close the loop means securing between $3 million and $5 million in funding and navigating through a maze of land ownership. The total estimated cost includes planning, design, construction and funding an endowment for ongoing trail upkeep. Van Everen says they’re eying a Federal Lands Access Grant that could take a significant bite out of the overall price tag. The first priority in closing the loop is building the section through Haskill Basin, which received a big boost last week in the form of a $150,000 Land and Water Conservation Fund grant. Along with a required $150,000 match in private donations, the money will fund construction of 5.5 miles of new trail and two new trailheads. One will be on city-owned property along Reservoir Road and would be similar to a park setting with picnic sites and parking for up to 40 vehicles. The other trailhead on Big Mountain Road just below Whitefish Mountain Resort will also serve as a winter trail groomed for Nordic skiing access. It would be built in partnership with Glacier Nordic Club and the Iron Horse subdivision on an easement provided by Whitefish Mountain Resort. Van Everen says about $350,000 to $500,000 is needed to complete the Haskill phase, which is anticipated to open next spring. From there the trail effort will turn to a section from a new trailhead at Holbrook Overlook off Big Mountain Road traveling northwest toward Swift Creek. Navigating land ownership issues will be a challenge on this stretch, Van Everen said, noting that it’s a mix of Forest Service and private holdings. “It’s a patchwork of private land owners and we will need their support to complete the vision,” she said. It’s planned to have the Holbrook to Swift Creek section opened by 2018. The Swift Creek to Beaver Lake section is tagged to be finished by 2019/2020, representing completion of the project. Van Everen points out that passing through the wetlands at the lake headwaters and crossing Swift Creek could prove to be cost prohibitive and will likely require some environmental analysis. But it’s worth investigating, she said. Van Everen says momentum from the first 36 miles of trail building will help carry the project into the next and final phases. Gunderson agrees, saying that completing the loop would be of national significance.